Whether the new bull market has begun or not, it is clear that stocks have been in rally mode. Can they keep it up? Reviewing the technical situation, we try to get a sense of the market by looking at the data we gather from the Alert HQ process. We use both daily data and weekly data to compile the market statistics discussed below. An overview of the short-term technical picture is presented in the following chart of market statistics based on daily data collected by our Alert HQ process. Each weekend we scan over 7200 stocks and ETFs looking for BUY and SELL signals. We also collect various technical information that we roll up into charts like the ones below. The first chart is based on daily data, the second chart is based on weekly data. Looking at the chart above based on daily data, we that stocks have essentially gone straight up since the fourth of July. There is a wide divergence between the number of stocks trading above their 20-day moving average and the number trading above their 50-day moving average. Likewise, the number of stocks whose 20-day MA is above their 50-day MA is also lagging. This is an indication that, based on daily data, stocks have moved so quickly they have left their 50-day moving average way behind. Note also that we are getting to the area where the last rally peaked. As a minimum, I would expect to see consolidation soon with stocks spending some time moving sideways. Looking at trend information, Aroon analysis based on daily data shows more and more stocks in strong up-trends and fewer and fewer stocks in strong down-trends. Based on weekly data, the action is similar but moving more slowly. Looking at accumulation, the Chaiken Money Flow analysis based on daily data shows that buying pressure eased this week. The weekly data, however, still exhibits a gradual increase in buying pressure. It's clear that investors are for the most part bullish as most stocks continue to show improvement. The moving average analysis presented here confirms the bullish disposition. If you look at the major indexes, you will see that the Dow and the S&P 500 are just poking above their 50-day moving averages. Significantly, however, the NASDAQ and the Russell 2000 have both moved above their 200-day MAs and seem to be hanging onto their gains. If the NASDAQ and the Russell 2000 can continue this behavior it will certainly be bullish for the entire market. There is one chart, though, that I feel compelled to share. 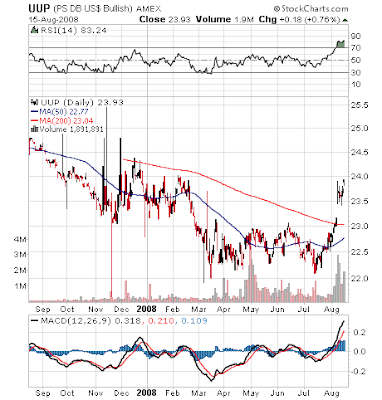 Below is the chart of the PowerShares U.S. Dollar Bullish ETF (UUP). You can see how the dollar has sharply broken out to the upside. This action in the dollar is pointed to as one of the bullish catalysts that is driving the current rally. It's worth looking at some of the pros and cons related to the dollar rally. Some observers have pointed out that a rising dollar will slow exports. This would be a serious issue as exports have been the one bright spot in U.S. manufacturing. Others have said that the dollar would have to appreciate quite a bit more before exports would be negatively activated. Let's call this one a wash for now but it could turn into a negative in the trend continues. The higher dollar causes commodities that are traded in dollars to appear cheaper to U.S. consumers. This should eventually translate into a lower inflation rate. This would clearly benefit consumers; hence, the strong action in the consumer discretionary sector. Let's call this one a plus. So why is the dollar appreciating? Typically, a country's currency appreciates if interest rates are higher than rates in other countries. This implies that the country's economy would be doing better than other countries. Is that the case today? Far from it. The dollar is appreciating because the perception is that the U.S. economy is so weak, the Fed dares not raise rates. With European and Asian economies also slowing now, the expectation is that the Europeans and Asians may have to lower their rates to stimulate their economies. Ironically, after being the source of the global economic malaise, the U.S. is now perceived as less bad. We can call this a wash, also. This brings me back to exports. A rising dollar will eventually cause U.S. exports to slow but more immediately, the weakening foreign economies will undoubtedly reduce demand from abroad. This is clearly a negative. It means that the manufacturing sector will see a shift. After being focused on exports, it will become more dependent on domestic demand. And speaking of demand, falling commodity prices, rather than being an effect of an appreciating dollar, are more accurately a reflection of falling demand due to slowing global economic growth. Another negative. So with the dollar strengthening and commodities weakening the rally in stocks continues. Yet the underpinnings of the rally have some a decidedly uncertain foundation. There are as many analysts who insist this is just a feel-good rally in a bear market as there are analysts who feel we have seen the bottom and the markets are heading up from here. For now, our technical analysis indicates the way forward is up while the fundamentals are less convincing. Let's hope the fundamentals catch up with the technicals.